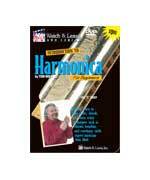 Introduction to Harmonica DVD by Tom Wolf is a harmonica lesson designed for the beginner. Utilizing all of the latest in video technology, it starts the beginner off with proper technique (hand positions, mouth positions, blowing & drawing). You'll quickly learn scales and chords and the 15 song examples illustrate techniques like double stops, vibrato, trills, cross harp, and bends. It also has a section on playing along with other instruments. All of the notation is on screen with a pointer showing each note as it's being played. This is the perfect tool for the beginner to learn how to play the harmonica. This is the companion DVD to Harmonica Primer Book with CD.